These are an affordable gift to make at any time of the year. You can make them for Christmas presents to any bird lovers on your list, or you can make them for yourself to hang on the trees outside. Once you have the ingredients on hand you can make lots of them and attract all kinds of birds and even the squirrels if you want. 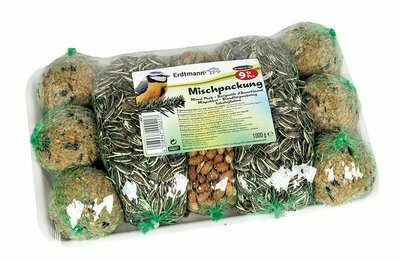 You can change up the "flavours" by simply changing the bird seed you use. You can use straightforward plain seed, homemade or the fancier types with nuts and dried fruit, or you can add your own dried fruit. The secret ingredient is "plain gelatin" This stops them from going rancid outside and holds them together nicely. Step 1 - Measure out 4 cups of the bird seed into a large bowl. Add the 3/4 cup of flour and mix. Step 2 - Then take a measuring cup and add 1/2 cup of water and stick in the microwave for approximately 30 seconds just to heat the water enough to dissolve the gelatin. Add the gelatin to the water and stir until thoroughly mixed. Step 3 - Add the 3 tablespoons of light corn syrup and mix. Once you have the corn syrup mixed in with the dissolved gelatin, then pour over the seed in the bowl and mix well. Step 4 - Using some waxed paper spread over a cookie sheet, lay out your cookie cutters or molds and spoon the mixture into them and totally fill and pressing the mixture well. Step 5 - Taking a skewer or sharp object, create a hole for the ribbon. Then cut up a straw into 1 inch pieces and stick in the hole to keep it open while the ornaments set. Step 6 - Place in fridge overnight or at least 8 hours. Pop them out of the cutters or molds and then take out the straw and add your ribbon. These make great gifts and they can be put outside right away. Perfect for any time of year. Check out the video below for more instructions. The video above will help you create the perfect birdseed ornaments that you can give as gifts to the bird lovers in your life, or simply for your own backyard friends. But if you love the idea of them but don't want to make them yourself, you can purchase them online below. If you love the idea of these ornaments but don't want to make them yourself, you can purchase them online. Just click the above picture or link to find out more. Simply hang these in your yard and watch your fine feathered friends enjoy the treats. 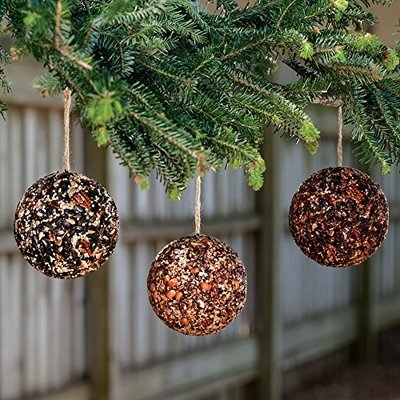 You can get super creative with bird seed ornaments and gifts. If this is a gift for someone, and you are feeling creative you can also take the simple ornament a step further and create a edible bird house yourself, (click here for instructions) but if you would prefer to purchase this type of gift, you can get them online with Amazon, just click the above picture. There are so many ways to feed the birds! You can make your own decorative seed cakes, or you can purchase them already made. Everything from a simple seed ball to an elaborate edible bird house. Bring your yard to life this winter by attracting birds, they will thank you with their beauty!